Posted on the Instagram account of regular scooper Umberto Gonzalez, what we're looking at is obviously concept art instead of photography, but the picture does give us our best look yet at the special Batman armor worn by Ben Affleck in Batman v Superman: Dawn of Justice. While it will be interesting to see just how well Bruce Wayne can actually move around inside of that thing, it definitely looks like it could be capable of taking a punch from a yellow sun-enriched Kryptonian. In the Miller-written story, Batman has essentially turned Gotham City into the safest city in the country by basically running the pace. Superman is sent in to the city by the U.S. government to take Batman down, but the billionaire uses his inventive mind to create a suit that will allow him to survive the fight. 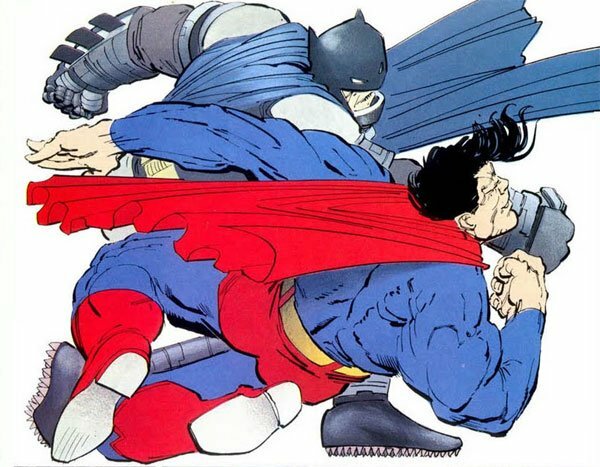 At this stage it doesn't look like Zack Snyder is creating a direct adaptation of this story in Batman v Superman: Dawn of Justice, but he also hasn't been hiding the immense influence that the legendary comic has had on the approach. There's still a long road to go as we wait for Batman v Superman: Dawn of Justice to hit theaters, with the film now deep in the process of post-production, and Warner Bros. set to unleash the finished beast in theaters on March 25, 2016.